This Zig Zag card tutorial is fab for giving your cards more depth and is a great way of mixing several paper patterns together. 1. Download your zigzag card template, cut a piece of white card stock by 20cm x20cm. Score the width of the paper at 5cm, 10cm and 15cm. 2. Following your template guidelines, fold the card in half and score the middle section at 2cm, 6cm, 8cm, 12cm, 14cm and 18cm up to the score lines. Cut all of the score lines while the card is folded. 3. Cut two 19.5cm x 4.5cm strips of the True Blue 8x8 backing paper and adhere to the side panels. 4. Use your favourite papers to decorate the two inside panel sections. 5. Die cut some of the cogs, using silver cardstock and use to decorate the two inside panels. 6. Die cut the letters DAD and stick to the centre of the card. 7. To complete your Zig Zag card, you can download the free envelope template here. Using your chosen 12 x 12 backing paper, cut your template out. Score and fold as shown. Stick the sides using double sided tape. 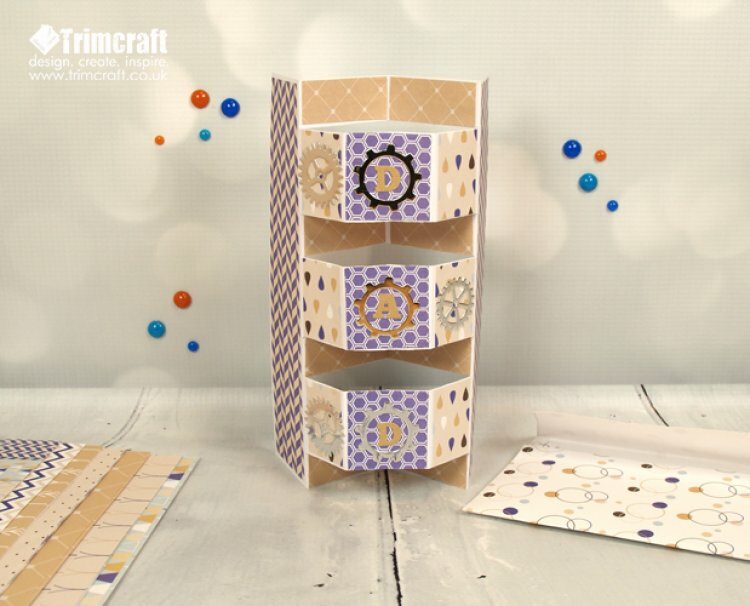 Have you been inspired by our card master class? Why not upload and share your card creations onto the project gallery?